Located in the heart of the busy streets of Hanoi Old Quarter you will find a little gem! This little treasure stands tall amongst the colourful old streets that are typically flooded with loads of people and scooters. If you are wondering about where to stay in Hanoi, look no further than the gorgeous Paradise Boutique Hotel. Actually we thought this hotel was so perfect that we decided to make it our base whilst travelling out to Sapa and Halong Bay. We stayed at this awesome hotel three times and we had a chance to check out three different rooms, so we can recommend this place to you, with knowledge and recommendations to suit a room for every style and every need! 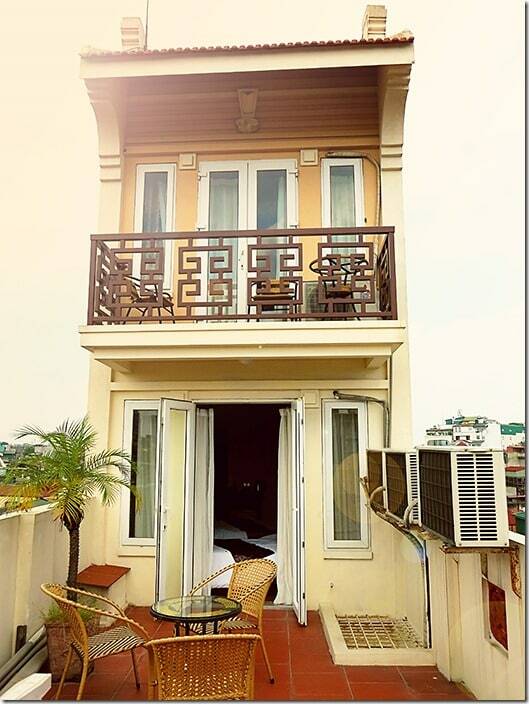 We reckon it is the best hotel in Hanoi, especially in the ‘budget' price range class! 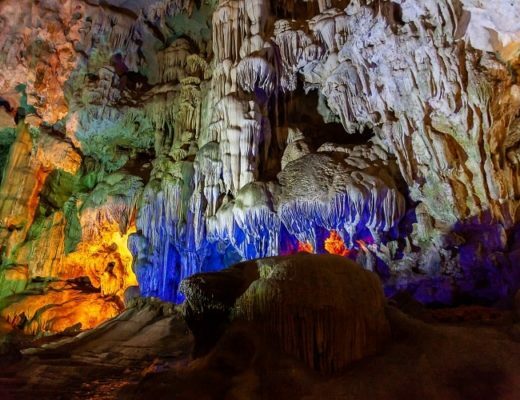 Experience a Brilliant Cruise at Halong Bay! 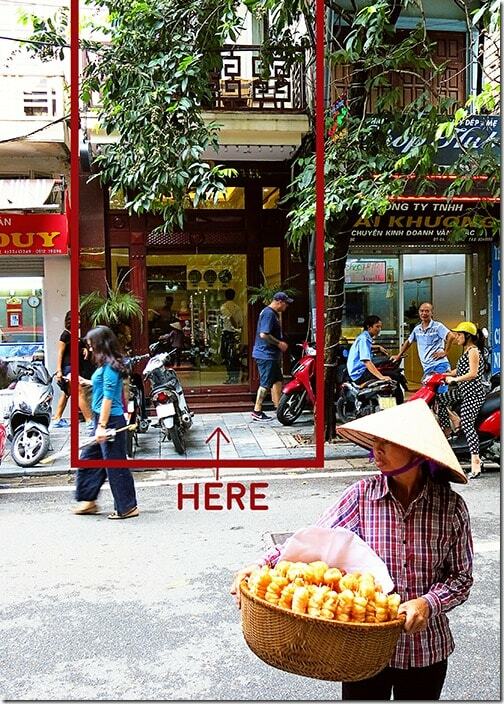 Where is this Hanoi Boutique Hotel? 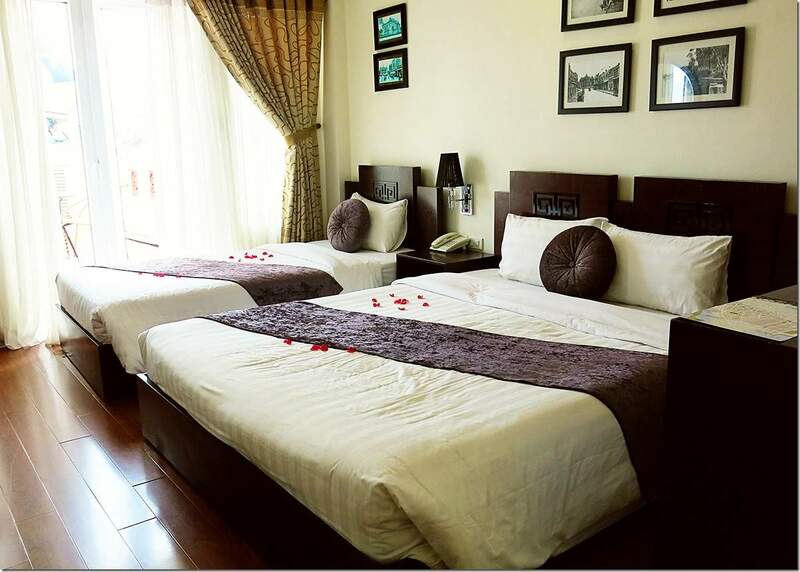 Paradise Boutique Hotel is located right in the centre of the beautiful, extraordinarily busy with tourists, but very comfortable Hanoi Old Quarter. When searching on the map, just type in 62A Hang Bac street, Hoan Kiem dist, Hanoi, Vietnam. Although this area is so crowded with tourists and locals alike, this is a perfect place to really experience the culture of this beautiful part of the city. Masses of restaurants and street food to indulge your taste buds with, colourful and inviting souvenir shops all around and friendly and smiling faces up and down all the narrow old streets. 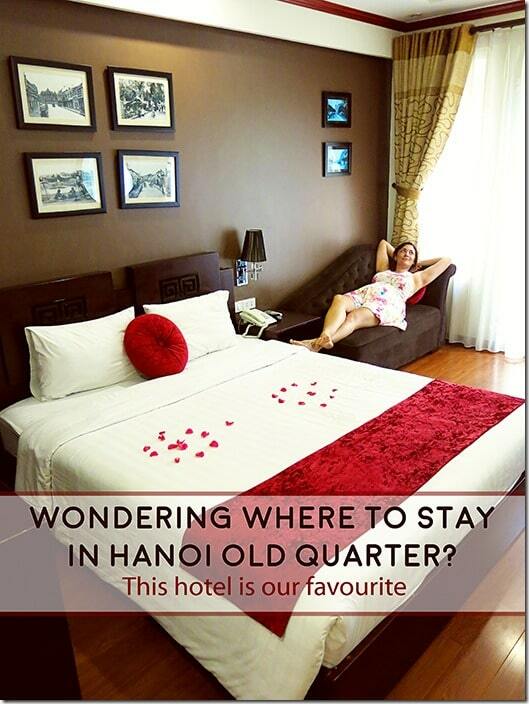 This Hanoi hotel is truly is the perfect spot for exploration of the Old Quarter of Hanoi! For the lack of a better word this hotel is perfect!! We loved it!! Before you can even open the door, the concierge is already outside helping you with the bags whilst ushering you into the cool, air conditioned lobby. Here you are greeted by more smiling faces asking you to rest in the comfortable waiting chairs. Within few seconds you have a thirst crunching welcome drink in your hand and a cool wet small towel to refresh your skin. Cannot fault the service here. From the minute we stepped in, to the moment we booked out, the staff at this hotel has been nothing but friendly, helpful and absolutely awesome. So make sure to ask them for helpful hints on where to eat in Hanoi, or where to have a nice relaxing cocktail or two. We spent three nights here in Paradise Boutique Hotel on separate occasions. So, let me tell you a bit about the rooms we got to experience. Family Suite Room 706 was the first room we stayed in. Located at the rear of the hotel with a larger terrace, it’s one of the largest rooms in the hotel. Very cool 270 degree views over the old town, where you really see what it’s like for the locals living here. We stayed in the Superior Room (808) on the second night in Hanoi Old Quarter. This is a top floor room with only one window, which makes this room the quietest and the most peaceful one. If you need a little break from the hustle and bustle of the Old Quarter; even though this one is small and compact; we got some beautiful sleep here. We stayed in Suite Room 209 on our last night in the town, so we wanted to get amongst it a little more. Located right at the front of the hotel, with a private balcony overlooking the street not far below, it is a perfect place to check out the night life and get closer to the noise of the movement in the streets. Haha, don’t worry. The balcony was a double glassed door, so most of the noise is blocked when closed. 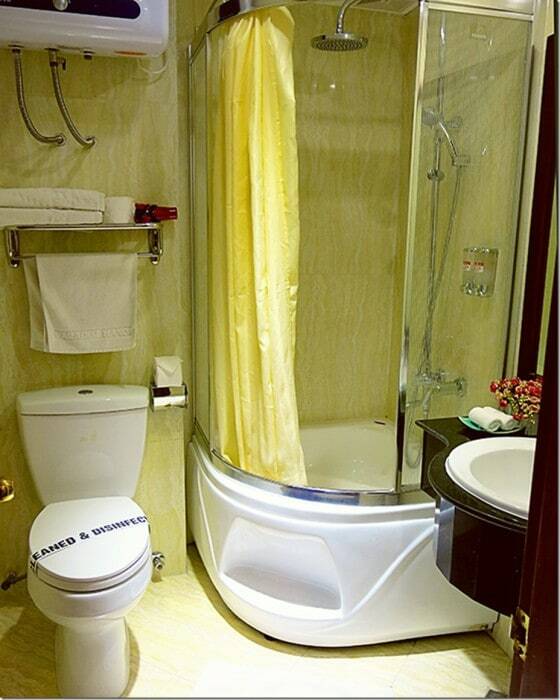 This room also has a bath tub for those who love to soak away. All the rooms are very clean, immaculately tidy and have very comfortable beds. Shower, TV, Safe-box and free Wifi are amongst things available. There are coffee, tea and two bottles of water complimentary, but you can also find a few other things in the fridge with affordable prices to quench your thirst. Paradise Boutique Hotel is a top 3 star hotel, so their facilities are limited, however we believe you simply do not need any extra spa, hairdressers or beauty parlours here. We were so busy exploring and roaming the streets that we only slept in the hotel and went in and out to annoy them for recommendations of where to eat and feast. The most friendly staff of this hotel will help you with organising to wash your clothes at the local laundry and give you hints on what to do an where to go around the Hanoi Old Quarter. They will look after your luggage after check out, so you can still explore the town until pick up to next destination and you can also have a refreshing shower before you leave. Buffet breakfast is included in the price of the room, so wake up in time and get your bum downstairs to the restaurant for a feast. All the usual goodies are here to indulge in, like coffee and tea, eggs, bread and croissants, butter and jam. Or if you need a little Vietnamese in your diet like us, just ask for breakfast noodle soup, spring rolls and fruit for desert. You choose which version you prefer. I just took all haha. Ohh, and pancakes with chocolate on top. Yumm!! 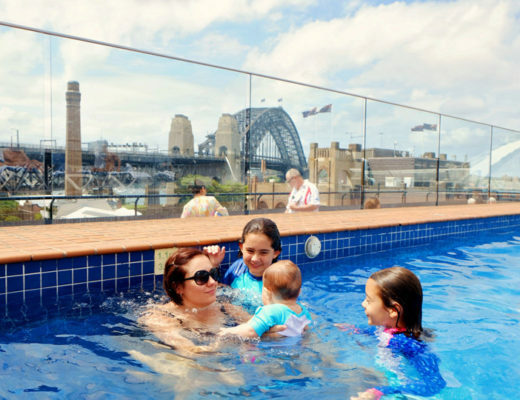 Check Latest Prices | Read the TripAdvisor Reviews | Book this Hotel Now! Ideally located in the heart of Hanoi's historical streets, Paradise Boutique Hotel is close by the gate of Hanoi Old Quarter and is just a minute's walk to Hoan Kiem Lake. There are plenty of dining and entertainment options that are easily accessible as well. First-time visitors to Hanoi should not miss a visit to attractions such as Opera House and Water Puppet Theatre and join in on the many tours the hotel provides. In addition to modern facilities, each room comes fully equipped with free Internet access and a daily newspaper. Other convenient services guests will find are currency exchange, a business center, and an indoor heated swimming pool that is perfect for a relaxing afternoon. (source – Agoda). This Paradise Boutique Hotel is highly recommended by us! 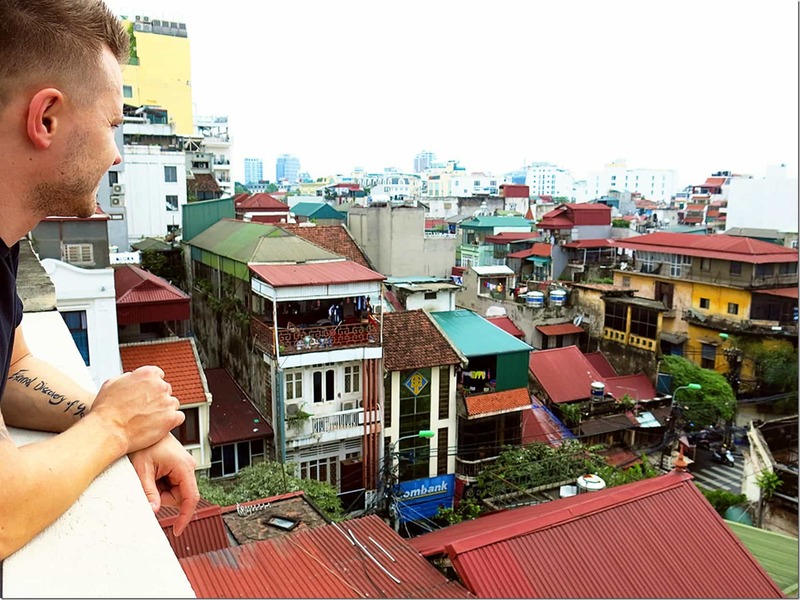 Click to read our very popular post about our recommended Vietnam Accommodation options here! Have you been to Hanoi Old Quarter? Where did you stay? If you are planning to go to Hanoi, will you stay at this hotel? * Please note, this post is not a sponsored post. We paid for our own accommodation and simply wanted to share our experiences with our readers as we totally loved our stay with Paradise Boutique Hotel at the Hanoi Old Quarter. Ah yes, I loved the North above the South! So highly recommend you go for a return trip! Sapa and Halong Bay were both spectacular! We hope to return to Vietnam one day too as we loved it so much! 🙂 Thanks for your comment Robert! Love the Staff who went out of there way to help .